Lloyd Foods director Darren Lloyd with the company's Toyota BT Reflex RRE 200 reach forklift. A Victorian food importer is poised to double its complement of Toyota forklifts after leasing additional warehouse space to accommodate rapid business growth. Lloyd Foods, based in Dandenong South (Victoria), supplies the food service industry nationally. It currently has a 2.5-tonne payload Toyota 8FG25 counter-balance forklift and a two-tonne payload Toyota BT Reflex RRE200 reach forklift. Director Darren Lloyd said the company has leased an adjoining building and will soon commission more reach trucks to service the increased warehouse area. “The business has quadrupled in the 18 months we’ve been operating,” Darren Lloyd said. “When we opened in 2015 we had another brand of forklift, but after eight months we switched to Toyota forklifts as they ticked all the boxes. The forklifts are flexible and reliable, the service back-up is excellent and our account manager is very responsive to our needs,” he said. 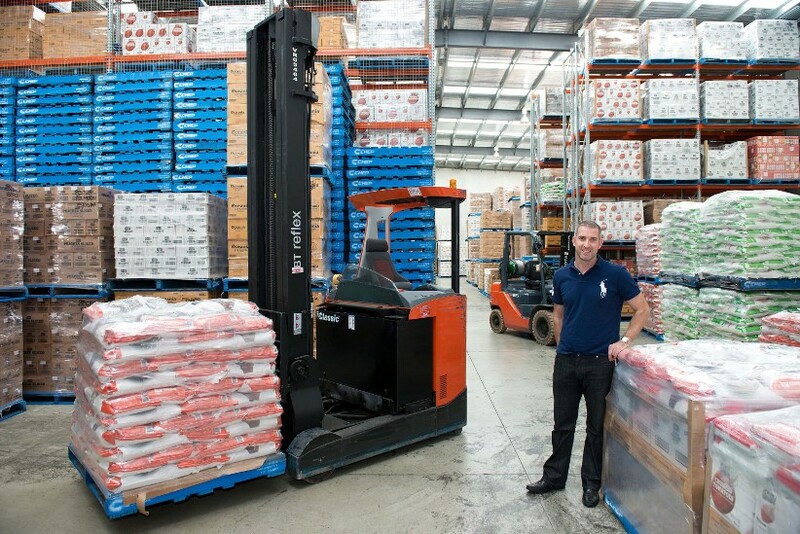 Grant Owen, area sales manager for Toyota Material Handling Australia’s (TMHA) Melbourne branch, said Lloyd Foods uses the gas-powered Toyota 8FG25 forklift primarily to unload and load trucks. “It is also used to unload containers using a labour-saving slip-sheet attachment, while the Toyota BT RRE200 reach truck works in high racking and narrow aisles,” he said. Lloyd Foods was founded 18 months ago when Darren Lloyd bought an existing food import business in Sydney before renaming it and relocating to Melbourne. TMHA offers five Toyota BT Reflex reach forklift models with payload capacities from 1.4 to 2.5 tonnes, all designed around the four core values of safety, productivity, durability and driveability. An advanced transitional lift control system achieves high-speed yet completely smooth lifting and lowering. This intelligent design supports faster work cycles while supporting safe operations. Toyota’s 8FG25 is the top selling counter-balance forklift in Australia and is widely used across many industries. “The popularity of the Toyota FG 8-Series forklift range is based on proven reliability that means they keep on going in all environments, giving customers excellent performance, service and good value for money,” Grant Owen said. The award-winning 8-Series Toyota forklifts have a number of leading safety features, including Toyota’s System of Active Stability (SAS) technology that helps prevent tip-overs. So what’s the difference between owning a car and a novated lease?